I have to admit that it felt a little strange to be contemplating reading a Christmas book in September, but I opened up this book and started reading and within the first page I was lost in the story. I ended up reading the whole book in one sitting as I just couldn’t put it down! Penny is an ice-sculptor; she loves her job, her gorgeous cottage and her lovely dog Bernard but she is lonely. She’s been hurt before so looking for love is not high on her agenda yet it is obvious she would love nothing more than to find her Mr Right. Henry and Daisy rent Penny’s annexe and after an amusing misunderstanding before Daisy arrives, they all hit it off brilliantly. The course of true love never did run smooth though, and it is very difficult for these three to form different relationships with each other leading to misunderstandings galore. The chemistry between Henry and Penny just radiates off the page from the word go; it seems very apparent that these two simply have to get together. I can’t think of many other couples in contemporary fiction who were more suited to each other than these two! I love the many characters in this book, they all know about Penny’s past heartache and just want her to fall in love again. The way they help her at times leads to very embarrassing but hilariously funny situations, like the time Penny went to buy a toothbrush. I actually laughed out loud at that bit! The setting of this novel, White Cliff Bay, is described in such vivid detail that I could completely picture it and I really want to go there for a holiday. 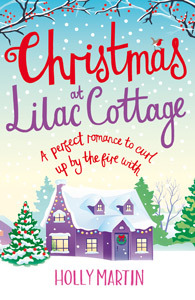 I’m so happy to discover that Holly has written a second Christmas book set in the same location and that is out very soon (30th October, I believe). I already cannot wait to be back in White Cliff Bay! I highly recommend this book, it’s wonderful. It’s one of those books that you can curl up with on a cold day and just escape, and when you’ve finished reading you feel all content and warm and smiley. I rated this book 10 out of 10. I received a copy of this book from NetGalley in exchange for an honest review, but I’m going to buy my own copy too as I want to be able to revisit White Cliff Bay again next Christmas! This entry was posted in Books, ebooks, Read 2015, Review and tagged Book Review, BookoutureChristmas, BookoutureXmas, Books, Chick Lit, Christmas2015, ebooks, Fiction, Holly Martin, Read 2015, Review. Bookmark the permalink.